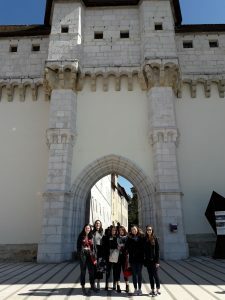 We caught up with SAI Paris Program Coordinator Jenn, who is contributing to our blog this month. Jenn is highlighting one of the SAI-included weekend excursions. 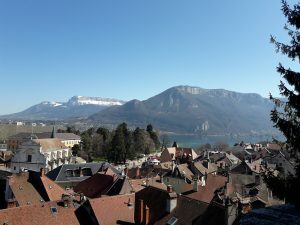 One of the SAI Paris Excursion destinations is the Medieval town of Annecy. 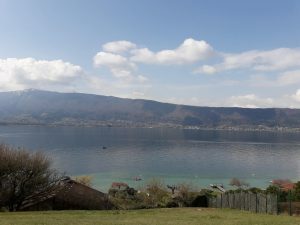 Located about 30 mins south of Geneva and 90 mins east of Lyon, Annecy is in Southwest France not far from the Swiss border. The town is surrounded by fourteen mountains and is famous for its crystal-clear lake with a greenish-blue hue. The river Thiou flows through the city along with small canals that criss cross the city center. Wandering around on foot you feel like you are crossing one small landmass to another as you weave your way through the canals and city. 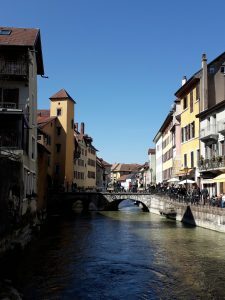 The weekend excursion is a nice break from Paris, as Annecy is small and easy to explore on foot, and full of friendly locals ready with a smile and patience. After a weekend there of breathing the crisp mountain air and feeling the sunshine on your face, you leave refreshed after a quiet relaxing weekend surrounded by beautiful scenery. 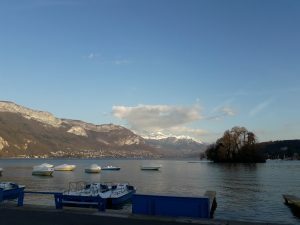 From a 12th century château (former residence of the Counts of Geneva) and a Medieval prison (now a museum), to many outdoor activities on or surrounding the lake, there are many things to do there. The adventurous Spring 2018 group of SAI students went on a 41km bike ride around the lake! As far as cuisine goes, the town is in the Haute Savoie region and cheesy mountain cuisine does not disappoint with its raclette, fondues, and tartiflettes. Known as the “Venice of the Alps,” Annecy is a must see charming town off the beaten path as far as tourist destinations in France go. The SAI Paris office welcomes students to study abroad with SAI in the semester and summer at the American University of Paris (AUP), Paris College of Art (PCA), Paris School of Business (PSB), and Paris American Academy (PAA).